Not me. I didn't spend a lot of time over by William Paterson when I was growing up. And less time since then. I think one of the places torn up by the real housewives was over there. Maybe the North Jersey Country Club? Paul, the restaurant I was thinking of is Novelli...maybe I am confusing it with another place...was it a different Italian restaurant before it was Novelli's? Recently, meaning the last few years? Thanks. My wife & I had another excellent dinner at Viaggio last night. It was pretty crowded for a Thursday night. This time we tried the Prezzo Fisso menu, which is a bargain at $53.00 for 4 courses. Please note that each course is a smaller portion than if you were to order it a la carte (except for the secondi/main course which is a full portion). On top of the excellent courses we had last time (Fried Calamari, Kabocha Squash Cappellacci, and Branzino), we also tried the very tasty Fried Cauliflower with romesco & charred lemon, and the excellent tagliata (sliced steak) cooked perfectly medium rare with some nice crispy roasted potatoes with a tasty cippolini agrodolce sauce. I would have liked to have tried the gnocchi with duck ragu (that everyone is raving about) but they wouldn't substitute it on the Prezzo Fisso menu (even with a supplemental charge). Apparently the chef already portions them out in full size orders and didn't have any left over. For dessert we took home the Rosemary Olive Oil cake (and substituted caramel sea salt gelato for the vanilla) and some Cinnamon gelato (both very good, although I would have liked the cinnamon gelato plain, without the unnecessary candied nuts & apple chips). The service this time was 100 times better than the last time. Our waiter Zack was very knowledgeable & professional, and did not rush us (unlike the last time). Wayne definitely could support a few good restaurants. It is a sharp contrast to Totowa which punches well above its weight. Benissimo, Nicola, Spiga, Cynthia's, etc. Or, Fairfield. Agreed. Very good point Paul. Looking at a map, perhaps the weird location of Wayne is one of the reasons. The only thing we really disliked about this restaurant was how annoying it was to get to from the major highways. Coming from the east it's a good 15 minutes from either 80 or 208 unless you loop around to 202. Wayne is one of those huge, sprawling places left over as other towns are formed. Parsippany, Bridgewater, Hillsborough, Woodbridge etc are others. Although I've never been a huge fan of Wayne, I did always feel there would be more quality restaurants. It seems to have a lot -- it seems vast, a lot of highway access, main roads, retail, etc. Maybe I am wrong, I don't know. Like I said, while I was never a huge fan, I would go on occasion, visit friends, maybe hit the mall, etc. -- and I felt it was "convenient" so to speak, at least for me, coming from Northeast or Northwest Bergen County. Route 80, 46, and 208 can get you there, although you have to deal with Route 23 (I hate Route 23, LOL). I guess being it's not convenient off the GSP or the TPK could be taken into consideration. On the restaurant side -- there was that one Italian restaurant, on Hamburg Turnpike, not too far over the Wayne border. It was a stand-alone building, pretty good reviews, good food, and I had heard a few people complain about the owner having a poor attitude. Anyone remember this place? Also, the Fountains. The Fountains. NJ Monthly gave Viaggio 3 stars. "What emerges from Felice’s open kitchen can be astonishing. Antipasti consistently hit it out of the park, from the pate-au-choux-coated cauliflower fritti, with their gutsy romesco drizzle, to the jumbo slabs of ultra-crisp bruschetta, heaped with intensely flavorful caponata, red pepper, basil and house-made pork pastrami. Charred Spanish octopus tangled beautifully with velvety gigante beans and a dollop of apricot mostarda. A bowl of homey polpetti (meatballs) snuggled on a bed of fontina-spiked polenta and bright tomato sauce. Primi and secondi had some winners, too. Our table nearly came to fisticuffs over pillows of ricotta gnocchi coated in a delectable duck ragù. An Amish chicken cacciatore came together wildly well, with its cheesy polenta, earthy mushroom mounds, deeply flavorful sauce and extraordinarily moist, crisp-skinned breast. Felice’s salumi are impressive, especially the duck prosciutto, beef bresaola, and the unctuous, silky porchetta di testa offset by pickled veggies." "Felice may need to juggle a little less and finesse a bit more. On one visit, a subtle yet lovely farfalle with shrimp and leeks and a zippy, Batali-inspired bucatini amatriciana with house-cured guanciale were both marred by drastically undercooked, nearly unchewable pasta. Another night, house-made cappellacci were tender and eye-catching, but tasted more like dessert than dinner with their creamy kabocha-squash filling, brown-butter sauce and hazelnut-brittle topping. A delicate, pouch-steamed branzino fillet on a bed of fregola pasta drizzled with olive caramel sauce was too sweet one night, perfectly balanced another." Excellent commentary -- and the positive part, very descriptive and very inviting, LOL. My wife & I had another outstanding dinner at Viaggio Sunday night. The good news is that management finally listened to all of the complaints and now has seat cushions on EVERY seat! Woo hoo They are thin gray rubbery cushions and blend right into the seats. What a difference. We tried all new dishes this time. I have been meaning to try Chef Robbie's self cured Salumi. We tried a selection of three for $18.00. We chose the Duck Prosciutto, the Bresaola, and the Finocchiono (pepperoni cured with fennel). They were all cut razor thin and had nice bold flavors. They came with the most incredible pickled eggplant & some pickled radishes. The pickled eggplant had a nice herbal flavor to it. Chef Robbie needs to bottle & sell that. Next time we have to try the Chef's Salumi selection (of 5 different Salumis) for $21.00. I also finally tried the much raved about Gnocchi with duck ragu. It is worth all of the accolades. This has got to be the lightest most pillowy gnocchi I have ever tasted. The funny thing is that our waiter said that one customer actually complained that it was too light. He wanted a heavier gnocchi. Let him go to some lousy red sauce Italian restaurant then My wife tried the Scallops with fennel, blood orange, & pistachio. It sounds like a weird combination, but all of the ingredients went very well together. NJ Monthly just named Viaggio one of the best new restaurants of 2017. Some other notable new restaurants were Common Lot, Fromagerie (under new ownership), Bluff City BBQ, Cellar 335 (from Saddle River Inn Chef Jamie Knott), Kimchi Smoke, and The Kitchen Step (from Fascino chef Ryan Depersio). I have also included a link to the article listing all of the top new restaurants. My wife & I had another excellent dinner at Viaggio Sunday night. Chef Robbie had some really good specials that we tried. One special was very tender pork trotter meat that was fried up into a huge crispy ball and served over arugula, braised lentils, and orange marmalade. It was really good. Chef Robbie also just started offering Crudo. We tried the Black Eyed Tuna crudo with black garlic & fennel vin. It was tasty but a little too stringy. For an entree I had a delicious homemade Maltagliati pasta with a very tender Bison ragu and fresh shaved parmigiano in a red wine sauce. Yet another highly complementary article on Viaggio from Cody Kendall at nj.com. That's a great review. Reads better than 3.5, she liked just about everything. You've been right at every turn with this place. My wife & I had another excellent dinner at Viaggio Sunday night. We started off with their delicious onion focaccia, and we finally got to try the chef's salumi selection. Last night's chef selection consisted of Finocchietto (Fennel) Salami (which had a nice herbal flavor), Wagyu Bresaola, Coppa, and Prosciutto Di San Daniele (which was very soft & buttery). It also came with pickled cauliflower, pickled carrots, & pickles. For an entree my wife had her usual Branzino, and I tried the Bison Short Rib, (on Tubbs suggestion). Thanks Tubbs! It was very good. I especially liked the cheesy flavored farrotto that came with it. For dessert we took home the chocolate budino because we were too full to eat it at the restaurant. We probably would have been better off eating it at the restaurant. That budino is really delicious. Luckily mini-tubbs didn't like it so more for me and Mrs tubbs. 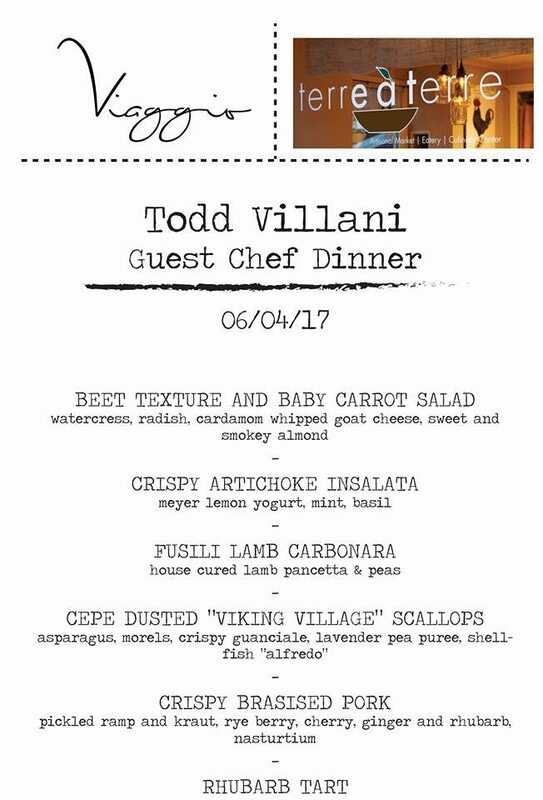 Chef Todd Villani, formerly of Terre a Terre, is collaborating with Chef Robbie for a special dinner event at Viaggio on Sunday June 4th. The price is $75.00 per person, and below is the menu. Hopefully their cooking is better than their spelling It doesn't seem to include wine, so you probably have to BYO. It looks very good. The curse of extremely high expectations: I thought Viaggio was very good. I didn't think it was great or anything. But of course, I only thought it might be great because of all I've read about it. I started with a special of charred asparagus under thick slabs of good mozzarella, squiggled with balsamic. Was what it was, meaning good. Then, pig's-trotter ravioli in a creamy tomato sauce. This cloyed slightly; I myself would say that a filling as rich as pig's trotters needs a less rich sauce. So only good, when I was hoping it would be great. The famous chicken cacciatore has regrettably gone with the winter menu. For the spring, it was replaced by chicken al mattone, over a big thick fettuna. Slightly disappointing only in that I wanted the skin to be crispier. So, again, only very good, when I was hoping for great. I want to emphasize that my niggling criticisms of Viaggio all arise from the high expectations I had for it. If I just happened upon this place in a shopping center in Wayne, I wouldn't be able to believe how good it was.